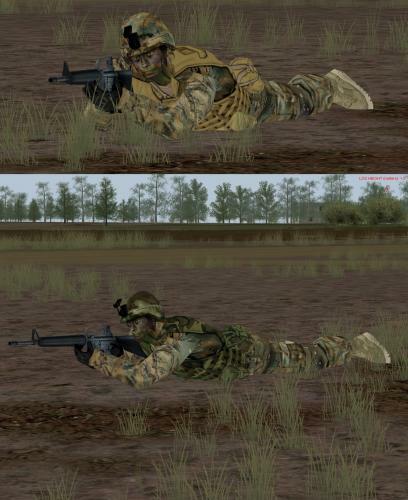 Recently adopted by the Australian Defense Forces, the Australian Multicam Camouflage Uniform (AMCU) replaces the Disruptive Pattern Camoflage Uniform. This should bring back nostalgia for some players. 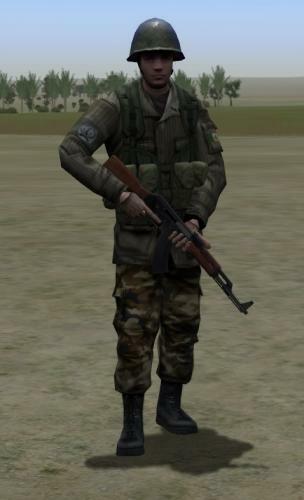 This is my rendition of the uniform from the Battlefield 2 Middle Eastern Coalition. They are shown wearing brown commando sweaters, sporting their MEC patch with green helmets and web gear. 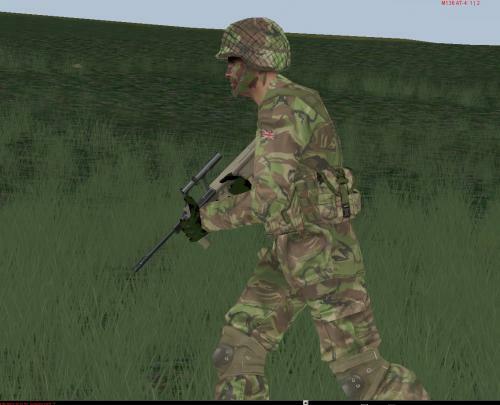 A small infantry skin mod for Stevo. 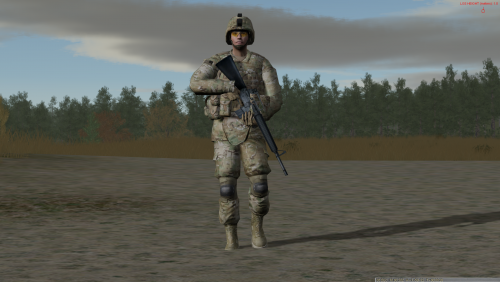 Update to my U.S. Army "multicam" pattern camo to better blend with improvements in version 3.025. (Primarily retoned colors and brightness). 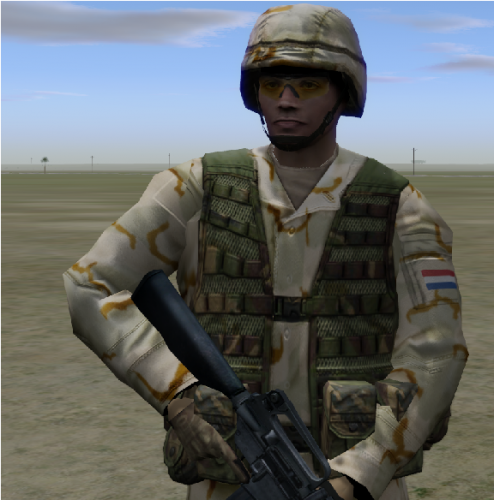 Update to my U.S. Army tri-color desert camo to better blend with lighting in version 3.025. 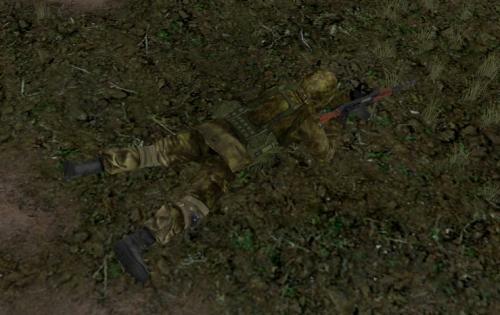 This camo is appropriate for desert scenerios from early 1990s through early 2000s. 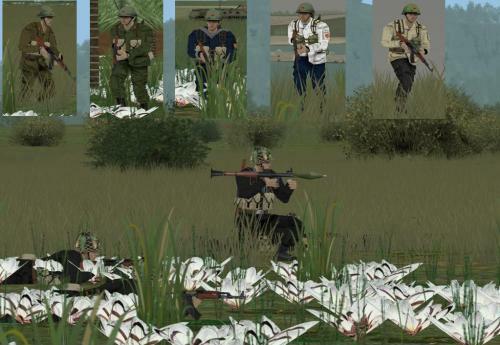 pack of French uniform .complete French colors pack V2.1. 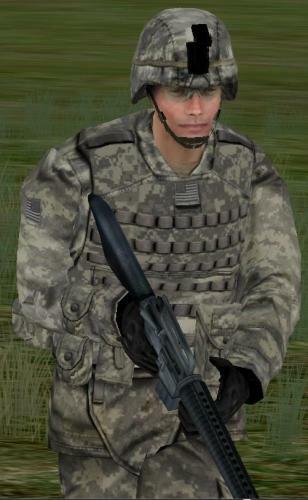 U.S. Army Desert Storm-era combat uniform using deja wolf's template. The pattern is often called "chocolate chip" or 6-color Desert. 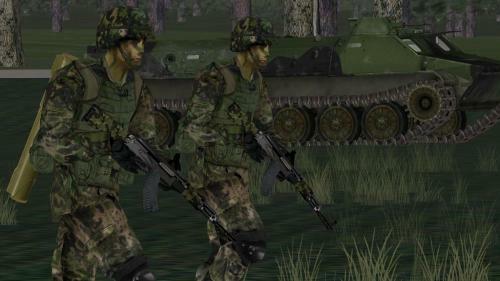 Attempt to replicate Forest MARPAT for SB Pro PE environment. The outcome is not too useful for summer themes, but may be someone needs this skin... Two versions of the skin included - with current issue CB vest cover, and obsolescent woodland colored covers for vest and helmet. 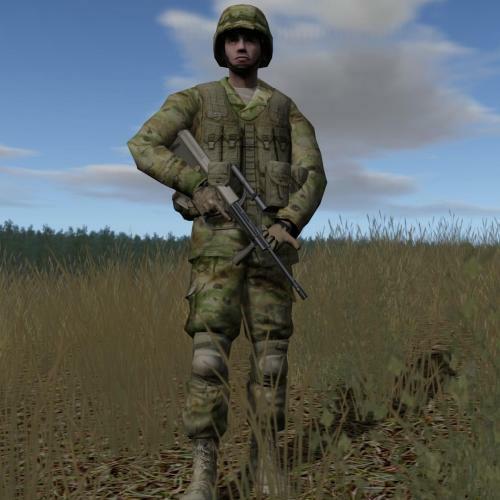 This mod depicts EDF serviceman wearing woodland camo based on soviet VSR-84 "Butan" pattern. This uniform is still issued to conscripts and reservists. Badge on the right shoulder sleeve is the insignia of Kuperjanov Infantry Battalion. The only way to use this mod is to replace with given files stock textures(for the sample- finnish). Mod is based on Dejawolf`s template. 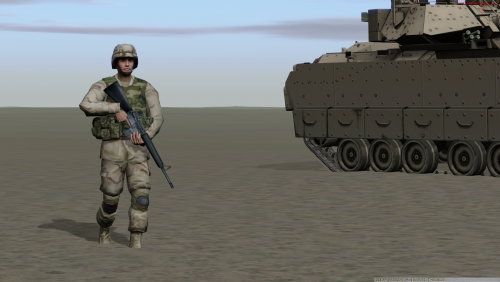 ...well, this camo pattern is not officially adopted by US army, but it looks quite interesting and promising for certain environments. 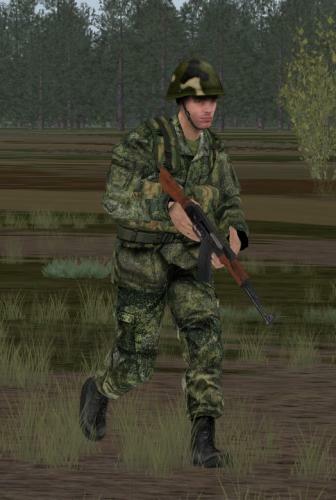 Re-skin of russian infantry model replacing obsolete VSR-98 "flora"-pattern with currently used EMR camo(also known as "army digi"). Based on Dejawolf`s template. Version 1.1: some changes to helmet. Now it resembles 6B14 without camo cover. 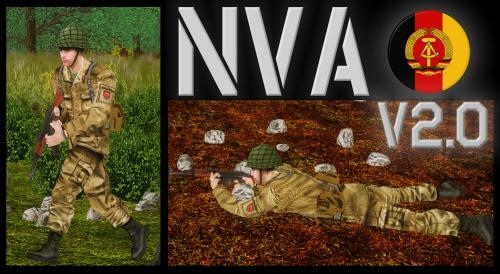 Skin depicts russian or belorussian infantry wearing fatigues painted in "silver leaf" pattern. 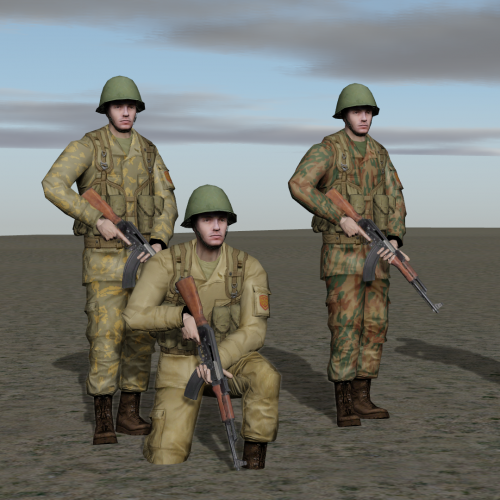 This mod can be used to represent cold-war era soviet troops or contemporary fighters from some para-military factions. Finnish infantry in the m/05 desert camo. 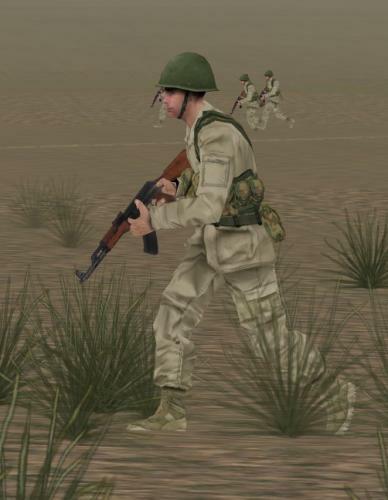 The Finns also operate more in the desert environment these days and along with the new m/05 summer, autumn and winter camo colours came the new desert camo. The camo pattern looks quite like the German version, but "unique" enough to stand out. But why would anyone want it to stand out? It's a weird world, where a camo pattern is made more visible just to avoid being identified as americans...? Or so the cynical rumour says, who knows if there is anything to it. Nowadays when Finns operate in international missions, the gear of the single soldier includes for example bullet proof vests with protective sleeves and that's what you will see on this skin as well. 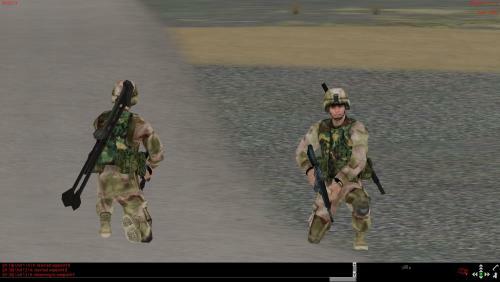 In some photos you see the combat kit is sand colour, but the green and olive are more common... Version 1.1: added the RK-95 mod by Ryujin, edit by me to include camo tape. To make it work for Finnish infantry only, add the ruswpn -file to same directory as the other files! 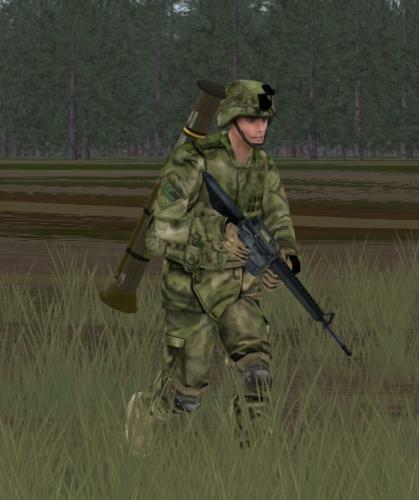 Summer and winter infantry for the Finnish Army, in the new m/05 camo pattern. The fatigues have been aletered a bit, added the protective vest and new m/05 PALS webbing, new gloves and boots, helmet webbing (summer), edited olive pouches with the new opening system, new face with summer and winter camo paint in Finnish style and markings for summer skin - Finnish flag in the left sleeve and optional Lagus' Arrows (used by troops trained in Armoured Brigade) in the right sleeve.<br /> <br /> The new combat gear was widely issued from 2009 onwards. The new carrying system m/05 is a huge improvement over the old m/85, because the new one can be fully customized and weight is better distributed. The new digital 4-colour camo patterns are a result of very thorough research - providing the best blending in the surrounding - so they say... And they may just be correct as I cannot find my pants anywhere. Again. Version 1.1: added the RK-95 mod by Ryujin, edit by me to include camo tape. To make it work for Finnish infantry only, add the ruswpn -file to same directory as the other files! 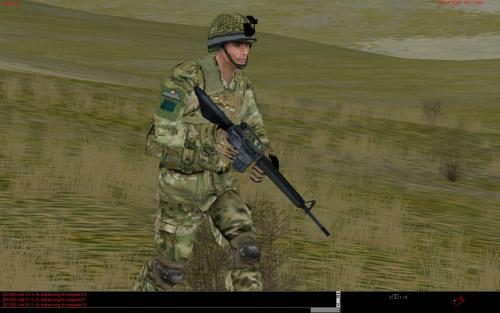 4 sets of skins for British Troops including 16th Air Assault Bde 3PARA skins with and without NVG mounts and straps for helmets, and 4th ARM Bde Guards Division with and without helmet netting. 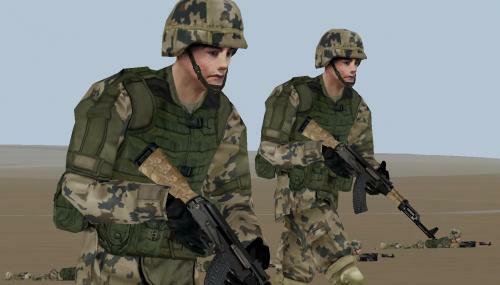 Skins use new Multicam or MTP (Multi Terrain Pattern) uniforms and MK-4 Osprey body armor. Uniform and associated files for Iran Basij militia during Iran-Iraq war. 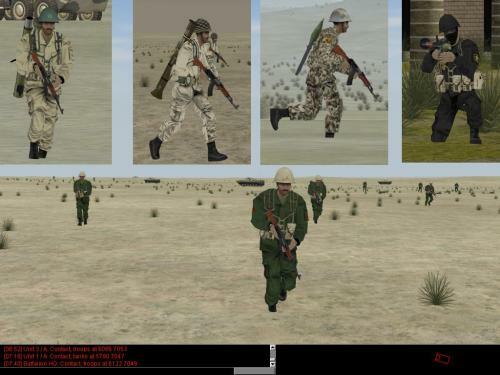 Five uniforms and associated face, hands and equipment skins for Saddam era Iraqi forces. 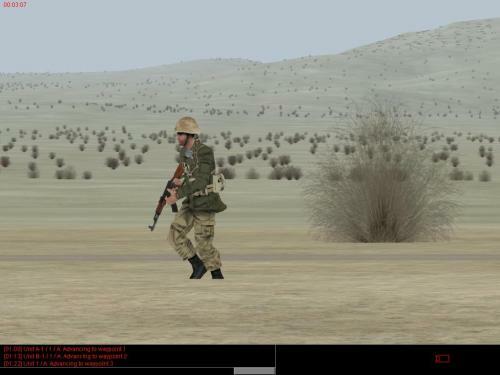 Includes regular Army, two Republican Guards and one Special Republican Guards, and Fedayeen Saddam uniforms. 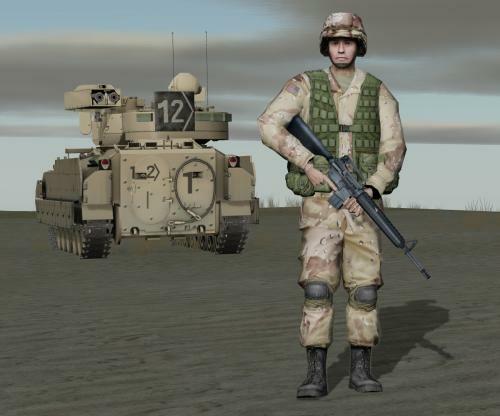 Replaces the US 1990s desert camo with a more accurate 3 color DCU and woodland interceptor vest.